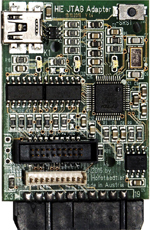 The HIE JTAG adapter is a FTDI® based USB JTAG debugger. It provides 3 JTAG connectors, the original 0,1" 20 pin connector, a 0,05" 20 pin connector and a 10 pin Molex Picoblade® connector compatible with Engicam® JTAG connector. Host connection is a USB 2.0 Mini USB type B connector with ESD protection. The HIE JTAG debugger has been tested with OpenOCD 0.9.0 on Linux and Windows. HIE JTAG debugger will support most CPUs like ARM®, MITPS®, X86® and many more, a JTAG debugging port is required. We provide an OpenOCD configuration file and a Circuit diagram v1.4. Download Product Presentation as PDF. There are many counterfeit FTDI chips on the market, http://zeptobars.ru/en/read/FTDI-FT232RL-real-vs-fake-supereal there is also a German article: http://www.heise.de to protect our customers, we produce the HIE JTAG debugger in Austria and buy all components from official distributors. 2. one ribbon cable, length 150mm, 3 connectors, 20/10 pin, 1.27mm 0.05"
The HIE JTAG debugger v1.3 is sold out, Version 1.4 is available. Version 1.4 contains an empty place for a 3 pin jumper to use VUSB as target VCC, this jumper is not populated. Our prices are per piece and exclusive of any shipping costs. On Linux install OpenOCD and GDB from your distribution repository. Copy the configuration file into the board directory. You will see a new USB device "HIE JTAG Debugger". Please note, the USB cable is not included. Now you should connect with GDC and debug your system. We thank all programmers of OpenOCD 0.9.0 for their great work. HIE JTAG is © 2014 - 2016 by Christian und Walter Hofstädtler.